I have a nerdy routine, but it works for me. Before you could say “overreaction” I had the family huddled in the corner of the basement while I clumsily tried to get the air mattress in a state to support human life. 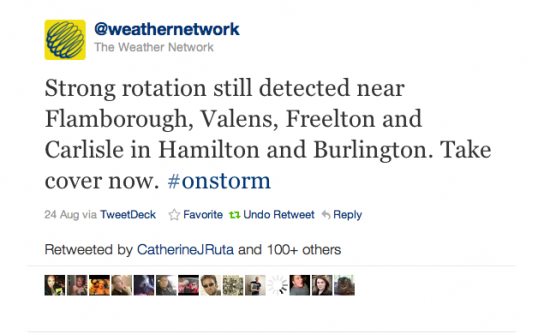 I made the most of our surely-waning electricity to follow the end-of-the-world #onstorm tweets on Twitter. It really seemed like disaster was upon us! I even began to resign myself to the fact that my blue box would surely be the first victim; never again to be seen. The storm passed and the panicked din of social media resumed its normal pattern of making light of everything, as though taunting nature to try harder next time. It led me to wonder; was the @weathernetwork “take cover” reaction too strong? Was this a classic example of fear mongering? I obviously know nothing about weather patterns or prediction, and in terms of ‘better to be safe than sorry‘ I would much rather be crashing about in my basement needlessly than risk my family. Perhaps the real issue is the noise the rest of us rubes make. This post How to tweet (or not) During a Crisis seemed like a pretty good place for us all to start the next time it seems like the world is about to end.